You don’t have to go to Europe to tour an abandoned castle. Bannerman Island, just north of New York City, has a spooky ruin you can explore. Bring an active imagination and conjure up a fantasy when you check out this unusual Hudson Valley attraction. I grew up believing this abandoned structure on an island in the Hudson River was the home of the Wicked Witch of the West and her flying monkeys in the classic film “The Wizard of Oz“. Learning it wasn’t didn’t ruin my 4th of July. And neither did the grey skies and persistent drizzle that accompanied my tour of Bannerman Island. Bannerman Island isn’t even its name (maybe I was a little disappointed). It’s really Pollepel Island, the Dutch word for ladle, a very rocky, 6.5 acre parcel. Its distinguishing feature is the castle, a familiar landmark to riders on Metro North since trains on the Hudson Line pass right by it. It’s located close to the eastern shore of the Hudson, midway-between Cold Spring and Beacon. Tours, organized by the Bannerman Castle Trust, began several years ago and, with the rainy forecast and no other plans, the 4th of July seemed a perfect day to explore the island. 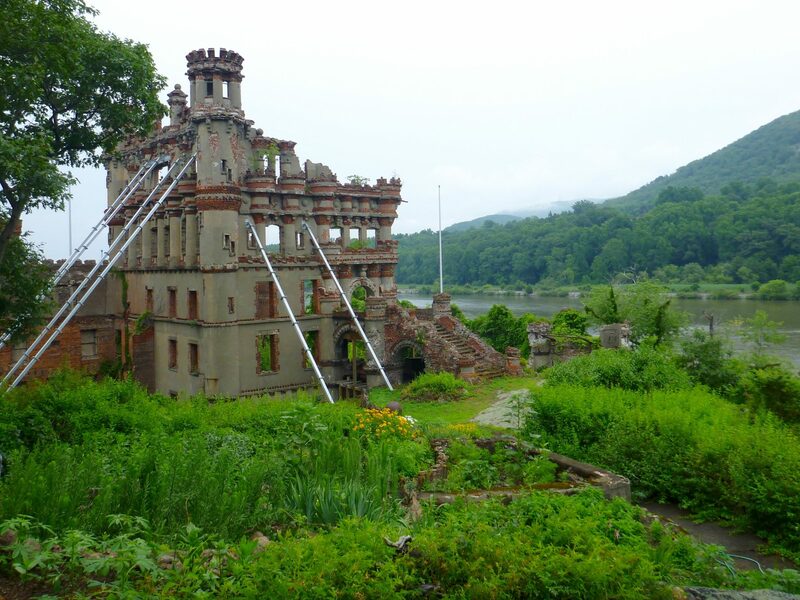 Bannerman Island tours depart from Beacon, NY, home to DiaBeacon, a contemporary art museum. Photo: Cathy Bennett Kopf/The Open Suitcase. Weekend boat tours depart from Beacon, New York. My holiday excursion included a bbq prepared by Loughran’s Irish Pub, folk music by DaProf N Starr, and a self-guided tour of the island. Tour proceeds support a variety of projects on the island, including the continuing stabilization of the structures, restoration of the gardens, and trail repairs. Kayak expeditions leave from several locations, including Cold Spring. Both Cold Spring and Beacon are easily accessible by car or by train – the trip from NY’s Grand Central Station takes just over an hour. 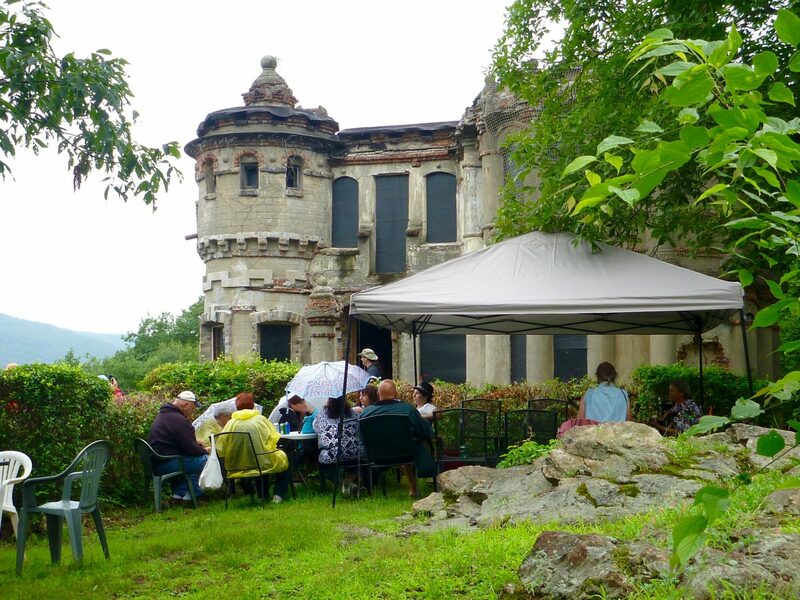 Bannerman Island Trust volunteers answered questions about the island’s history as a munitions warehouse. The fanciful castle structure was a warehouse, designed by the owner, Francis Bannerman, to resemble a fortress he saw in Antwerp, Belgium. Bannerman was frugal, using surplus materials such as cannonballs, bayonets, and cast-off iron beds as building materials for his family’s residence. Others might call this cheap…and dangerous. The island has survived numerous calamities: a munitions explosion in 1920, a fire in 1969, and a structural collapse in 2009. Because of the instability of the remaining abandoned buildings, most of the island is off-limits. But there’s enough to keep visitors occupied for a couple of hours, wandering around and wondering what is was like to live next door to tons of explosives. Additional information about the island’s history and available scenic boat tours is available through the Bannerman Castle Trust. 2019 tickets for the 2.5 hour excursion which includes the boat ride and walking tour are $35. The tour is not ADA-compliant. The island is fairly untamed; sensible walking or hiking shoes are recommended. So is bug spray if you’re going on a warm summer day. The truly adventurous might be interested in an evening visit. Local artist Melissa McGill has created a an installation of LED lights that come on one by one, creating a new constellation in the night sky. Liked this Hudson Valley post? Check out my visit to Franklin Roosevelt’s home in Hyde Park!